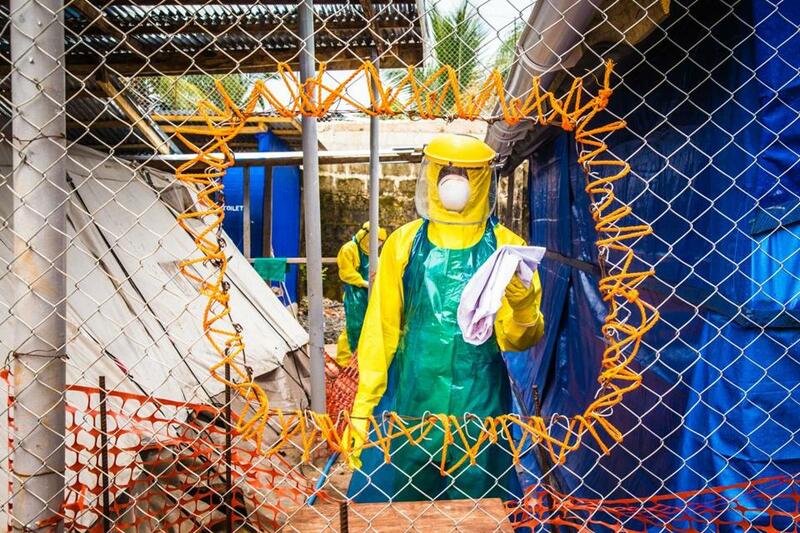 Health care workers in protective gear worked at an Ebola treatment center in Sierra Leone. The world is finally focusing its attention and resources on the Ebola crisis. After what World Bank President Jim Yong Kim this summer described as a “failed” international reaction, there is now serious mobilization of money, people (both military and civilian), medicine, and equipment. The commitments, led by the United States, are producing real action on the ground. That’s the good news. The bad news is that the disease is still spreading faster than the response. For every infected person in both Sierra Leone and Liberia, there is at least one, and in all likelihood double that number, who will catch the disease. Many treatment centers being built are not yet staffed, never mind open. Logistics teams are setting up isolation centers, but local systems do not exist to respond promptly when a case is reported. Services to dispose of dead bodies are being expanded — essential because the virus can live for three or four days after a person dies — but fear of cremation, without allowing a victim’s family to say goodbye to the body, is scaring people away from emergency treatment services. The nations in the crosshairs of the Ebola crisis — Guinea, Sierra Leone and Liberia — face common challenges that make containing the disease especially complex: high levels of poverty, weak state structures, and cultural beliefs about death and the afterlife that contribute to the spread of the disease, with health workers particularly at risk. This is not a remote or theoretical issue for me. The International Rescue Committee has 500 staff members, the bulk of them locals, across Sierra Leone and Liberia, fighting to tackle the spread. When I visited last week, they told me about dead relatives, broken medical services that leave pregnant women without help, and pervasive fear and tension. It is vital that we listen, understand, and adapt to these realities on the ground. The most important reality is that unless the spread of the infection is contained at its source, then no amount of curative services will meet the need. Two thousand emergency treatment beds should be available by the end of next month across the two countries. But what if 20,000 people need treatment? Posters across West Africa blare out a message that Ebola kills. That raises awareness. But to produce the right kind of action — basic precautions to prevent the spread of the disease and isolation for those who show symptoms so they can be tested and treated — a more grass-roots approach is required. One protocol shown to be clearly effective is community engagement. And if you’re thinking that this is the kind of grass-roots community organizing that President Obama led in Chicago in the 1990s, you would be right. In this case, it’s when nongovernment organizations seek to engage with local leaders and citizens to garner community trust, engagement, and participation. This approach has made an impact. In Kenema County, Sierra Leone, the International Rescue Committee organized 400 volunteers to canvass 200,000 households in 14 days. There was similar mobilization in Lofa County, Liberia. In both cases, official figures show infection rates dropping (granted, even official data are not foolproof given variables like secret burials). This was basic community work: going house by house, street by street, identifying cases, beating misinformation, educating communities. There is a similar picture from the pioneering work of social entrepreneur Mosoka Fallah, who is calling for 8,000 community leaders to mobilize in Monrovia. The test is to make this approach work across the built-up urban centers, notably the capital cities of Freetown and Monrovia, where residents live cheek by jowl, in densely packed communities, that make fighting the spread of disease even tougher. When I met a group of young women tackling Ebola in Monrovia, they told me that the fight against the disease was held back by outlandish rumor-mongering about spiritual curses and foreign causes. They were fighting these rumors, which exacerbate the spread, and could do so effectively because they were from within the community — local trust and credibility is the absolute key to changing behavior that will stem infection. Of course it is vital that the militaries of the world are being deployed to help the vulnerable poor and the brave health workers whose lives are on the line in West Africa. But another kind of army is going to be needed to win this war: community leaders. Our job is to find them, get them the correct information, and provide them with what they need to win their battle. Dr. Margaret Chan, director-general of the World Health Organization, is right to call this a “crisis for international peace” — a major epidemic risks driving political instability, conflict, and the destruction of hard-won economic development that has lifted millions out of poverty. There is no time to lose. David Miliband is president and CEO of the International Rescue Committee.